IP RIP (Routing Information Protocol) comes in two different versions: 1 and 2. Version 1 is a distance vector protocol (RFC 1058) and Version 2 is a hybrid protocol (RFCs 1721 and 1722). RIPv1 uses local broadcasts to share routing information. These updates are periodic in nature, occurring, by default, every 30 seconds. To prevent packets from circling around a loop forever, both versions of RIP solve counting to infinity by placing a hop count limit of 15 hops on packets. Any packet that reaches the sixteenth hop will be dropped. RIPv1 is a classful protocol. RIP supports up to six equal-cost paths to a single destination. Equal-cost path are the paths where the metric is same (Hop count). RIPv2 is a distance vector protocol with routing enhancements built into it, and it is based on RIPV1. Therefore, it is commonly called a hybrid protocol. RIPv2 uses multicasts instead of broadcasts. RIPv2 supports triggered updates. When a change occurs, a RIPv2 router will immediately propagate its routing information to its connected neighbors. RIPv2 is a classless protocol and it supports variable-length subnet masking (VLSM). Both RIPv1 and RIPv2 uses hop count as the metric. • Supports only classful routing (Does not support VLSM). •Supports classless routing (Supports VLSM). RIPv2 incorporates the addition of the network mask in the update to allow classless routing advertisements. • RIPv2 uses multi-cast instead of broadcast. Multicast communication reduces the burden on the network devices that do not need to listen to RIP updates. Routing Information Protocol (RIP) can be configured in a router using the following IOS commands. The “version 2” IOS command specifies that we are using RIPv2. The following diagram shows our lab setup. We have three routers, three switches and three hosts connected as below. The host names, IP addresses and the interfaces of the routers are shown in diagram. The IP addresses of the hosts are also shown in the diagram. Connect to Router01 console and use the following IOS commands to configure host name as Router01. Use the following IOS commands to open the fast ethernet interface Fa0/0 configuration mode on Router01 and configure IP address as 172.16.0.1/16. Use the following IOS commands to open the serial interface S0/0 configuration mode on Router01 and configure IP addressas 172.17.0.1/16. You have to set a clock rate also using the “clock rate” command on S0/0 interface, since this is the DCE side. Do remember to run the “copy running-config startup-config” command from enable mode, if you want to save the changes you have made in the router. Connect to Router02 console and use the following IOS commands to configure host name as Router02. Use the following IOS commands to open the fast ethernet interface Fa0/0 configuration mode on Router02 and configure IP address as 172.18.0.1/16. Use the following IOS commands to open the serial interface S0/0 configuration mode on Router02 and configure IP addressas 172.17.0.2/16. Use the following IOS commands to open the serial interface S0/1 configuration mode on Router02 and configure IP addressas 172.19.0.1/16. You have to set a clock rate also using the “clock rate” command on S0/1 interface, since this is the DCE side. Connect to Router03 console and use the following IOS commands to configure host name as Router03. Use the following IOS commands to open the fast ethernet interface Fa0/0 configuration mode on Router03 and configure IP address as 172.20.0.1/16. Use the following IOS commands to open the serial interface S0/1 configuration mode on Router03 and configure IP addressas 172.19.0.2/16. Connect to Router01 console and use the following IOS commands to configure Routing Information Protocol Version 2 (RIPv2) in Router01. Please refer the beginning of this lesson to view the Routing Information Protocol Version 2 (RIPv2) configuration IOS commands. Using the IOS “network” command, as shown below, we specify only the directly connected networks of this router. Connect to Router02 console and use the following IOS commands to configure Routing Information Protocol Version 2 (RIPv2) in Router02. Please refer the beginning of this lesson to view the Routing Information Protocol Version 2 (RIPv2) configurationIOS commands. Connect to Router03 console and use the following IOS commands to configure Routing Information Protocol Version 2 (RIPv2) in Router03. Please refer the beginning of this lesson to view the Routing Information Protocol Version 2 (RIPv2) configurationIOS commands. After the network is converged after the initial configuration and Routing Information Protocol Version 2 (RIPv2) configuration, we can use the “show ip route” to view the routing table in Router01, as shown below. The “R” character at the beginning of a line in routing table shows that it is a route discovered by Routing Information Protocol Version 2 (RIPv2) and “C” character shows that it is a directly connected network. When the network is converged after the initial configuration and Routing Information Protocol Version 2 (RIPv2) configuration, we can use the “show ip route” to view the routing table in Router02, as shown below. When the network is converged after the initial configuration and Routing Information Protocol Version 2 (RIPv2) configuration, we can use the “show ip route” to view the routing table in Router03, as shown below. 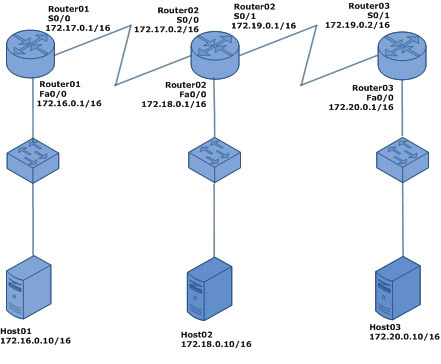 To verify the Routing Information Protocol Version 2 (RIPv2) routes and the connectivity between networks, run the ping command from Host01 (IP address: 172.16.0.10/16) to Host03 (IP address: 172.20.0.10/16). The ping reply from Host03 (IP address: 172.20.0.10/16) shows that the Routing Information Protocol Version 2 (RIPv2) is configured well in three routers and there is network connectivity between different networks. How to Configure EIGRP on a Cisco Router? OSPF, How to Configure OSPF in the Cisco IOS?